Remember singing those words in camp, or Sunday School, or somewhere when you were younger? I do, but I probably just sang it because somebody told me to. I didn’t really think about it. And yet, it does bring up good memories and emotions. RIght now, for me, our national news brings up bad memories and emotions. Just in the past week there were 2 mass shootings, adding to the multitude our nation has experienced. Not to mention bombings. And in local news, minor shootings, child molestation, rapes, domestic violence of all sorts. Now there is also Rhabdomyolysis. Wait, Rhabdo….what??? Maybe you don’t follow health and fitness reporting, but I have seen a few stories about this recently. 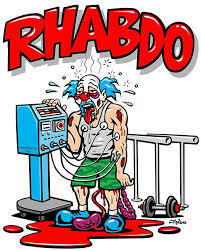 Rhabdomyolysis is the catastrophic break down (really an explosion) of muscle fibers, which leach proteins and electrolytes into the bloodstream. This release overloads the kidneys and can lead to renal failure and possibly death. Usually it is caused by crushing injuries, electrocution, or seizures. A clown that is obviously overexerting, bleeding, with kidneys and intestines falling out, and taking in a little dialysis between sets. Dialysis is not funny, Crossfit. Neither is this cartoon, nor the tees that are for sale, nor the idea that doing as much as you can, no matter what the cost (there is also a cartoon of Uncle Rhabdo vomiting and there has been recent news about peeing during CrossFit workouts). Here is a quote from a CrossFit participant: “I see pushing my body to the point where the muscles destroy themselves as a huge benefit of CrossFit.” Sick. Just like Uncle Rhabdo. This is from a man that spent six days in ICU after self-induced Rhabdomyolysis. This is a problem on so many levels. But for now lets just stick to the part of promoting pain rather than health and wholeness (what I thought fitness was supposed to be about). This idea of proving yourself–of glorified self destruction, or of being better than someone, or of feeling superior–is what I feel is at the center of our social violence. Our local middle school just began a program called “Rachel’s Challenge.” Rachel Peck was one of the first victims at Columbine High School and her family has established a program to end bullying in schools. Bullying is when, because of a low sense of self esteem but also fear of hurting themselves, young people instead hurt others. They usually pick on the ones that cannot defend themselves, so winning is assured. Rachel’s Challenge hopes to begin a chain reaction of kindness to help eradicate bullying in schools. It’s a beautiful program and I am hopeful that it will have an impact. Just attending the community meeting made me even more mindful of the importance of my actions toward others. And there were over 300 people at the event. Let the chain reaction begin. October is a big month for causes–usually the one most promoted is Breast Cancer Awareness Month. Yes, I hope we can end cancer of all types, but I am somewhat disheartened at the amount of funding put towards pink products. I’m not sure if it is spreading awareness or consumption. The other colored ribbon for the month is purple which represents Domestic Violence Awareness. Not heard of that one? Well, it might be that the ones suffering from it are usually destitute and don’t have the backing of big pharma to develop cures or products. How do we cure domestic violence? The same way that Rachel’s Challenge hopes to end bullying: by kindness. Bullies are the same whether they are children or adults: they need to hurt others to feel better about themselves. In fact, many bullies in school are from homes that suffer some type of domestic violence. This is a chain reaction that needs to be stopped. W-witness: A walking pace is the speed of community, which will lead you to witness a profoundly inextricable connection with all living things. A-accept: You place yourself in the palm of the universe and accept whatever life tosses into your laps. L-love: The more we learned from nature, and built a kind of inner resilience to external circumstances, the more we fell into our natural state–which was to be loving. K-know thyself: Our plans and actions buildup mental residue and this internal noise starts polluting our motivations, our ethics, and our spirit. The path that Nipun and his wife took began at Mahatma Gandhi’s ashram. Gandhi is maybe most remembered by his words, “Be the change you wish to see in the world.” Witness, Accept, Love, and Know Yourself. Be kind to your body and to who you are. You were born for a reason and that reason isn’t to hurt yourself, to prove yourself, or to inflict pain and suffering on others. In the yoga community, every class ends with just a simple kind word, Namaste. Simply put, it means that you honor the people that shared your experience. This is important. In yoga classes, we reveal our weaknesses and vulnerabilities as well as our strengths. Again, not a scene for Uncle Rhabdo. Good. Let us invent a mascot that is more like a beautiful child–not encumbered by mental residue, fully engaged in loving life, whose main goal is to grow, whose heart is broken by any hurtful action, and whose smile can light up a room. Let’s advertise that, maybe have a slogan like Nipun’s or Rachel. Pass on the smile, the love, and the peace. During the month of October, On The Path Yoga will be offering donation based classes every Saturday. All funds will go towards The Center for Women in Transition (CWIT). Also, every Saturday afternoon, a workshop around the theme of “Centered & Strong” will be offered, with a portion of the fees also going to CWIT. Please see our website for details. Or find out more about Rachel’s Challenge and participate locally to start a chain reaction of kindness. Let’s please stop hurting ourselves, hurting each other, and hurting our society. ahhh. I just finished up another summer of outdoor yoga classes. Although this summer we had the first rain day in three years and there was a morning at the end of July that we thought we might freeze…it was a good summer, truly a gift. Beautiful sunrises that got earlier, then later, until last week when we started in the dark fog of our little lakeside beach. By the time we finished our final Surya Namaskara there was light and birdsong. I love living here. I grew up in Northern Minnesota and moved to Houston, Texas in 9th grade (so my father could continue to provide food for our family), which is a pretty big move in many ways. However, both places landed me close to a large body of water. In my late twenties, while my husband went through graduate school, I experienced being landlocked for the first time in my life. Nashville has a lot to offer, even a river, but it doesn’t have a Great Lake or the Gulf of Mexico. I found myself missing the presence of water terribly. What is it about being by water…big water…powerful water…that speaks to me? I learned respect on the shores of Lake Superior. In Galveston, I learned freedom (I took a lot of beach “sick days” in high school). Here, with the Grand River, Spring Lake, and Lake Michigan surrounding me, I am learning connection. These bodies of water, past and present, speak to me and flow through me in ways I find mesmerizing and intriguing. Sun Salutations teach you how to flow from one yoga posture to another. Each pose is like a great body of water: powerful, with much to teach the practitioner. Respect goes to the Warrior; freedom to Down Dog. These basic postures take us from foggy darkness to great light. Flowing through them is like changing from river to lake to ocean. We maintain the same fleshy substance but create a completely different identity and sense of self. A Vinyasa practice teaches connection and dance. The elements in nature have so much to teach us about ourselves. Step outdoors–do a bit of activity in the elements. It doesn’t have to be yoga. Do what you love. Let nature speak to you. Listen. Connect. Dance and be free. In yoga we don’t “exercise,” we “practice.” What do we practice? Being present. Why do we call it “present?” Because it is all a gift, including the challenges.